GADOC, the Guernsey Amateur Dramatic & Operatic Club, was formed in 1927 with Lady Anne Sackville-West, the wife of the Lieutenant-Governor, as the Club’s first President. The Vice- President was Compton Mackenzie, who then lived on Jethou. 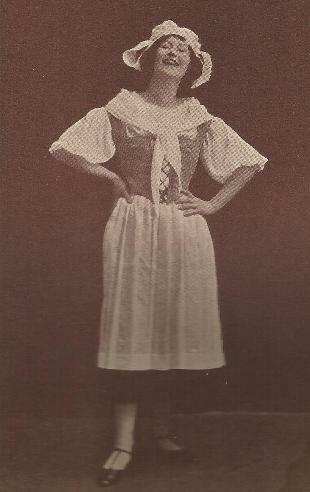 For just over two years, Lady Sackville-West was the mainspring of the Club, as producer and leading lady in all its full-length plays. The Club’s first production was “School for Scandal” in April 1927. Side by side with plays, GADOC had from the beginning presented an ambitious selection of musicals. In April 1930 there was a cast of over 90 in “Merrie England”, which was the first Club production to run for a whole week. Up to the end of 1930, all GADOC productions had been in St. Julian’s Theatre, which doubled as a cinema. With the coming of “talking pictures” the stage had to be removed for the new apparatus. So from 1931, all the Club’s musicals, and the larger straight productions, were staged at St. George’s Hall. Small-cast plays went to the Central Hall, largely used until then for concerts and lectures. It’s stage was enlarged, light battens added and the lighting circuits improved. It’s floor was then flat, and it’s seating only hard wooden chairs. The first musical in St. George’s in 1931 was the Club’s first venture into Gilbert & Sullivan – “The Mikado”. December 1931 brought the Club’s very first pantomime – a home-written “Cinderella”. Reserved seats were 2/6d, 1/9d and 1/3d, and all were 3d cheaper if bought at the door! The press reported that for the first performance of “The Yeomen of the Guard” in 1933, there were more people on the stage than in the audience – a situation which has occurred only once since, on the occasion of the Royal Wedding of the Prince and Princess of Wales when the enormous television coverage held the nation in thrall. With the coming of the War, the Club was dissolved, but those members remaining on the Island soon found themselves involved in small companies that played a large part in maintaining the morale of the islanders during the difficult days of the Occupation.